Loach wears his good intentions proudly as he continues his fondness for social realism and the working class. This time he takes on bureaucratic indifference towards citizens on welfare. It’s a worthy topic that deserves a director like Loach to treat it soberly and authentically, which he does to some extent by doing his usual routine of turning on a camera and letting people do their thing. 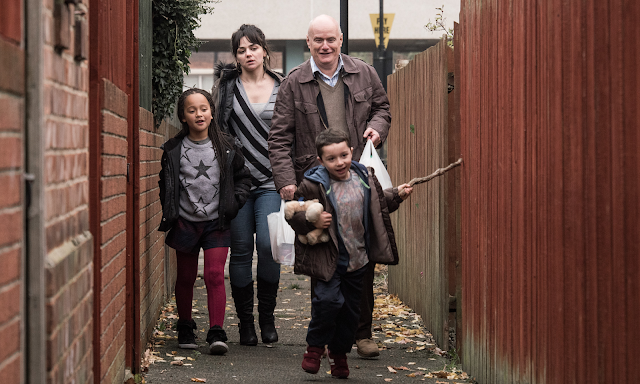 I, Daniel Blake is unusually preachy and soppy even for a Loach film as the screenplay by Paul Laverty wags its finger and tugs at heartstrings as the cold pencil pushers prioritise procedure over Daniel’s poor heart. The mix of blunt diatribe and sentimentalism, however, makes I, Daniel Blake resemble a first feature rather than the work of a master even if its accuracy is spot on. Clichés, rejoice. The only reason to see the film is for the incredibly raw and heartbreaking performance by Hayley Squires as Katie, a mother whom Daniel befriends in the welfare office. As Katie does everything she can to provide for her kids in dire circumstances, Squires shows the mother driven to desperation out of sheer love for her kids and a hunger for a better life. There’s a great movie in I, Daniel Blake somewhere as the relationship between Daniel, Katie, and her kids offers a warmly humanist tale about forming surrogate support groups when the system fails, but Loach loses it while preaching. It’s a sermon he’s told before and said better. I, Daniel Blake comes to theatres soon. Trolls is the most shameless marketing ploy to disguise itself as a feature film. This epic bastardization of resurrects a crappy childhood toy long forgotten. The movie is little more than a pathetic attempt to make the Trolls brand appeal to kids and hipsters who might fall for toys, soundtracks, and twee tie-in merchandise. There’s nothing in here that resembles a story or entertainment value as the three screenwriters string together some nonsensical situations as an excuse to play music. 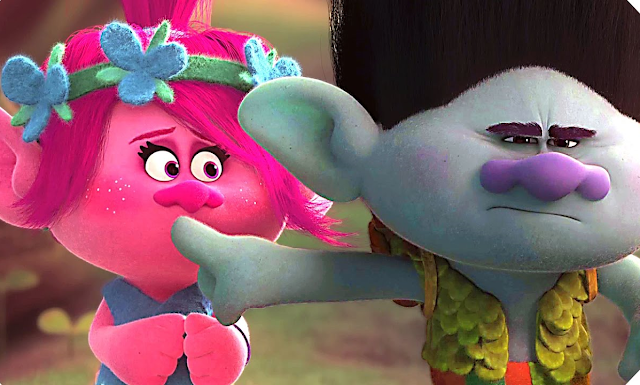 Trolls is all sugary pop songs and dated, humourless culture references. The animation is equally uninspired with ho-hum computer algorithms crafting figures that are as clunky as the fluorescent-haired dolls themselves. Sure, the final track “Can’t Stop this Feeling” is catchy, but it isn’t worth the utter hell it takes to get there. Spare your children! Spare yourselves! 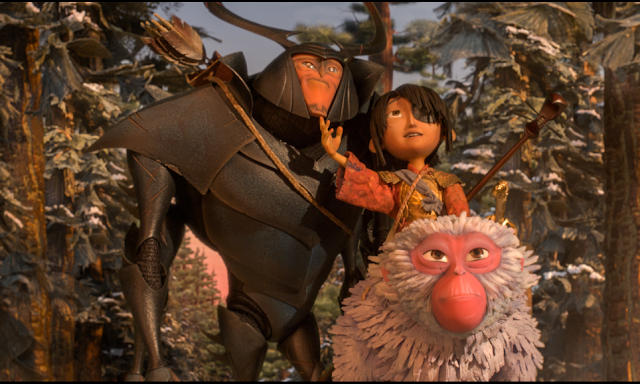 Beetle (Matthew McConaughey), Kubo (Art Parkinson), and Monkey (Charlize Theron), in Kubo and the Two Strings. Anyone looking for an animated work of art that isn’t condescending to parents or children must take in Kubo and the Two Strings. This stunning work from director Travis Knight and Laika Studios is one of the most impressive animated films in recent memory. Kubo blends innovative technology, classically composed animation, fun characters, and an enthralling story to deliver the full package. The film is ahead of the field in terms of its visuals and technical finesse, but what really makes Kubo soar is its magical quest. The film puts a young swordsman named Kubo, voiced by Art Parkinson, on a farewell adventure with his mother (Charlize Theron), morphed into a monkey to serve as his protector, as they battle ghosts and demons to collect some essential armour that will help the boy defend the village. Kubo conjures magical powers with the strokes of his chords, and as he finds his confidence as a warrior and a musician, the film transports audiences on a rock and roll ride of samurai swordplay. It’s truly refreshing to see a great and original work in feature animation. Kubo and the Two Strings is now on home video.